All Barber quarter values start at $4.60 . With silver in the range of $14.90 , dealers pay a minimum of $4.60 to $5.30 each for these old quarters. Most are worth more. For example, "S" mint coins are highly prized by collectors. Find an 1893-S, 1899-S or 1908-S and the value is over $25. This is for a heavily worn coin in "Good" condition. Better preserved examples, in higher "Grades" are easily worth hundreds. See more about how to "Grade" the condition of your Barber quarters below. What is the condition of your coins? Rare dates and mint marks are one factor to Barber quarter values. However, nice looking, high condition coins are very appealing to collectors, they make great additions to their sets and valued much higher. The choice Uncirculated Barber Head Quarter such as the one pictured is very popular and commands a value of over $157. Barber head quarter values vary widely. The chart shows a few rare dates steal the show but it is clear the higher the "Grade" the more your coins are worth. The above are wholesale Barber quarter values. Computed from dealer's price lists with various mark-up factors figured in. They reflect closely the value you would expect to receive when selling. You have a better chance of finding a better "grade" coin than a rare date. An 1911-S for example, in well worn "Good" condition is a $5.30 coin. If yours is in the better "Extremely Fine" condition it quickly becomes a $137 coin. Many examples of a wide price range exist. 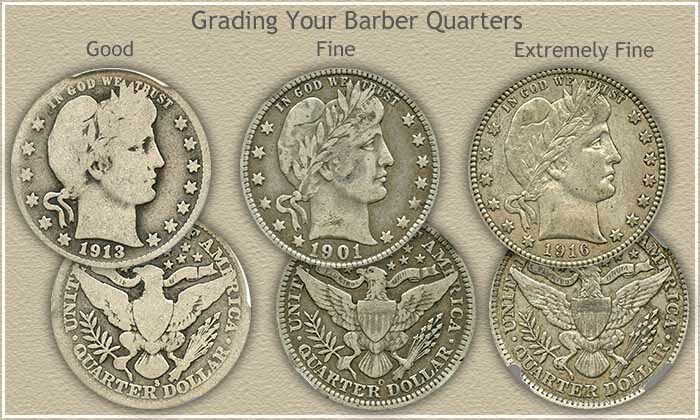 To accurately determine your Barber quarter values compare your coins to the grading images below and assign each a grade. Then... check the coin values listings. A full "LIBERTY" spelled out on the headband separates a coin in "Fine" condition from one in the lesser "Good" condition. On the reverse all of "E PLURIBUS UNUM" across the ribbon must show. If your coin is crisp and sharp in all details you have a highly desirable Barber Quarter. Most in extremely fine "XF" condition are worth $50 or more. Is your coin very nice and possibly a very high grade? Many small details come into play in the higher grades, especially the uncirculated grades, affecting the value. If you are not sure, there is help available. How to accurately judge condition involves a few subtle points to identify. A step by step process is followed in the Grading Barber Quarters video. Check a few rare coin dealers and auction house listings, look for those offering Barber Head Quarters for sale. Their listings and prices usually include a notation of the NGC or PCGS assigned grade. Additionally, these coin dealers are potential buyers of your coins. The rarest Barber quarter was minted at the San Francisco mint in 1901. 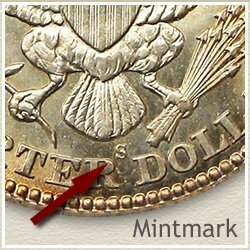 The "S" mintmark is located on the reverse just below the tail feathers of the eagle. Find a 1901-S in your group and you are holding a $2,298 coin. Other mint marks, "O" for New Orleans and "D" for the Denver mint are all located on the reverse in the same place. No mintmark was used by the Philadelphia mint. Examine your coins closely, many of the mint marked coins carry a surprising premium value. Barber quarter values have a bright future. The series is very popular, with many collectors assembling collections as a result increasing the demand for nice coins. Dealers require a steady supply to meet this demand. Should you decide to sell your coins, there is a ready market. Whenever curious of your Barber quarter values, return and stay up to date of the market. Judging the grade is critical to understanding true value. How to video combined with close-up images and descriptions covers the process of grading Barber quarters. Print the Coin Values Worksheet to list your Barber quarters and record their values. Should you decide to sell... use the worksheet as an invoice and packing slip when sending coins through the mail to dealers. It indicates you have done your coin values homework.